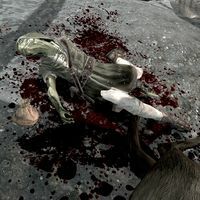 Argonians are unnamed and deceased Argonians scattered around Skyrim. These Argonians are both female citizens who wear randomly determined farm clothes (7 variants) or a belted tunic and random boots (4 variants). They also have a 50% chance of wearing a random hat (3 variants). They have a 25% chance of carrying a lockpick and/or a small amount of gold. One is in Darkshade, in the southwestern corner of the first chamber, near a charred corpse. 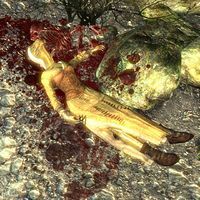 One is in the depths of Labyrinthian, on a ledge right above the first underground lake, with a chest nearby. Another one is added by the Dragonborn expansion, located at the Wreck of the Strident Squall in one of the lower decks. This Argonian is a male citizen and wears randomly determined farm clothes (7 variants) or a belted tunic and random boots (4 variants). He also has a 50% chance of wearing a random hat (3 variants). He has a 25% chance of carrying a lockpick and/or a small amount of gold. He always carries Guide to Better Thieving. This page was last modified on 5 September 2014, at 04:11.